New Ways To Mystify carries on its prestidigitation in the vein of For Magicians Only . 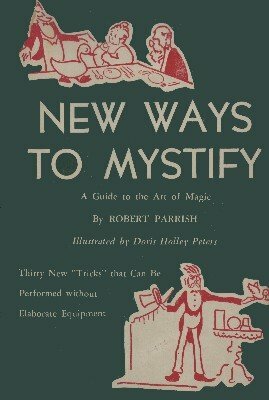 Again Mr. Parrish has presented thirty "tricks" that can be performed without elaborate equipment, and with no more skill than the average person can muster. It's all in practice and in knowing how to distract the audience, Mr. Parrish says, and he demonstrates in such a simple manner that anyone, young or old, can master these feats of magic. The general plan of the ebook follows that of the earlier volume, and Mr. Parrish again writes in his witty, urbane fashion. Dozens of simple diagrams, as well as clever chapter head and tail pieces, have again been provided by Doris Holley Peters. 1st edition 1945; original 124 pages; PDF 66 pages. Chapter One AND THE PURSUIT OF MAGIC . . .